Ronaldo has received the first yellow card, after taking off his shirt during the celebration of his goal against Barcelona, while the second one, after referee de Burgos considered Ronaldo was diving, in order to get a penalty kick. Ronaldo began his red cards career in his first season at the Bernabeu, during a match against Almeria in which he received the first yellow card to take off his shirt and the second one after a foul he committed against the opponent to receive the first red card with Real Madrid. 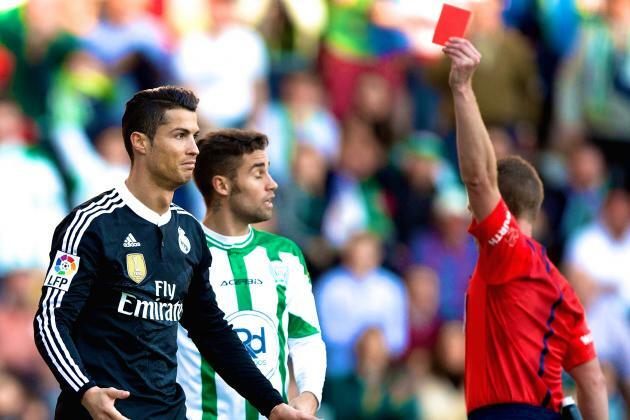 A month later, Ronaldo received a red card immediately after a nudge to Malaga defender Patrick Miltega. Don got a three-year truce with red cards until he lost his nerve in the derby against Atletico Madrid and kicked Gabi, captain of the Rojiblancos, He was then suspended for two games. But during Carlo Ancelotti first season, Ronaldo was back to red cards after he kicked Athletic Bilbao's player. And against Cordoba in 2014-2015 season, Ronaldo gets another red card directly after his violent deal with a defender. Including the card he got in Camp Nou last Sunday, Ronaldo's total red cards both with Real Madrid and Manchester United is 10.